Julia Marton-Lefevre, Director General of IUCN (International Union for Conservation of Nature) and Keynote Speaker at the 2012 Esri International User Conference in San Diego, announced the immediate availability of species data on ArcGIS Online. Aligned with their mission to “influence society to conserve nature and natural resources in an equitable and sustainable manner”, IUCN has collaborated with Esri and Blue Raster to release species range data for their collection of over 32,000 species. 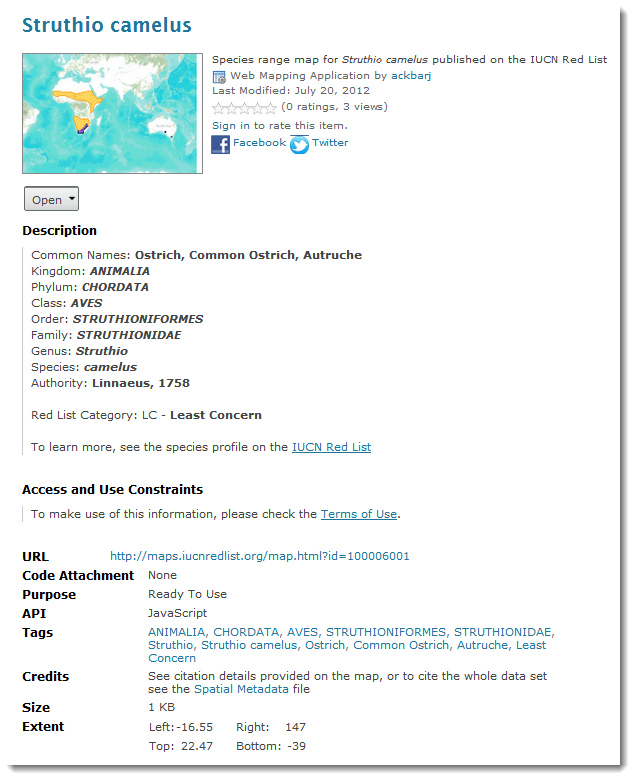 Anyone can search ArcGIS Online for a species, view the scientific taxonomy, and see the species range map as published on the IUCN Red List. ArcGIS Online is directly linked to IUCN’s interactive mapping application which now provides the ability to download the species range data in GIS-ready format.